Double the drying power – in just one towel! 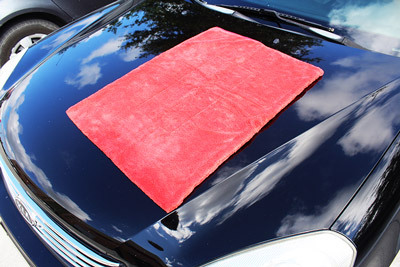 Britemax UberMax IncREDible Drying Towel is a super plush microfiber drying towel that will safely remove water from the surface of your vehicle without marring or scratching. With just one seam around the entire towel, made of a super soft suede, Britemax UberMax IncREDible Drying Towel uses every inch to absorb water. Keep your freshly washed vehicle look water-spot free with the Britemax UberMax IncREDible Drying Towel! Failure to properly dry your car after washing will results in one thing – water spots. When water contains minerals, even in small amounts, and is allowed to dry on the surface of your paint, the water evaporates while the minerals do not. This creates that small round spot you see on your paint – not only are they unattractive, but they can also cause permanent damage to your surface. You can prevent that from happening by using a drying agent to remove water before it dries! The Britemax UberMax IncREDible Drying Towel easily covers almost half of an average sized hood - more than enough to dry an entire vehicle! To create a microfiber drying towel that was both safe and effective, Britemax had a genius idea – they actually took one extra-large piece of super-soft and absorbent microfiber, folded it in half, and then sewed the edge closed with a suede strip of fabric. This created a doubly-thick microfiber towel that absorbs twice the amount that another drying towel would! Even with this doubled down size, the Britemax UberMax IncREDible Drying Towel still measures a whopping 20 x 28 inches! You’ve just done the hard part of detailing (washing the entire car’s surface! ), make sure it stays spotless with the Britemax UberMax IncREDible Drying Towel! Britemax Pure Max Shampoo 16 oz. Warning: Use a SHOUT color catcher sheet when drying. This is an excellant drying towl. I use on a black F150 FX4. Very durable. The color will bleed when washing. Prewash first with a color catcher sheet before using. Use a color catcher sheet a few more times after that. Does the job, one towel does the whole car, mid-sized sedan. Good price. ProsAbsorbs well and is soft. Excellent car drying towel. Cleans up great. This single towel is superior to all other microfiber drying towels (except Big Blue which is equally great) at drying off my wet car. It has a terrific feel to it. The advantage of this large towel that I can use both hands to dry the car at the same time, decreasing the drying time. ConsIt takes a certain amount of physical skill to dry the lower panels of the car without dragging the large towel on the ground and getting it contaminated, which is why I prefer Big Blue to dry my lower panels. This is the one drying towel that is super absorbent and wonâ€™t scratch, or leave streaks. You can use this as a spot drying towel. Super soft and beats all the other microfiber drying towels I have used over the years. This towel really picks up the water. You probably ought to pick up two of them ! !